It was disappointing to see world No. 1, Rory McIlroy, uncharacteristically losing his cool last Friday during the WGC-Cadillac Championship at the Trump National Doral. Having pulled his second shot from the fairway on the par-5, 8th hole, into the lake, he then launched his Nike 3-iron after it. Players gain nothing from a display of petulance like this and there can be a downside, as such acts encourage publicity, which can prove to be an unwelcome distraction. McIlroy has earned his good reputation with the media and with those of us that love the game of golf, but this may evaporate if he cannot control his emotions on the course. Like it or not, he should remember that he is a role model for many thousands of young golfers. As far as the Rules are concerned, throwing a club into the water does not incur any penalty. If the player is carrying the maximum number of 14 clubs in their bag they may not replace a club that they have thrown away. If the club can be retrieved during the round they may use it again, providing it has not been damaged to the extent that it is non-conforming. 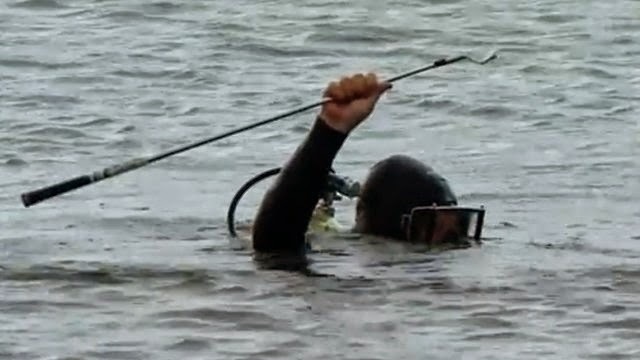 We now know that McIlroy’s 3-iron was recovered by an enterprising scuba diver, but not until the following day, when it was handed back to him on the practice range by the perpetual publicity seeker, Donald Trump. What you may have missed is that the following day, Marcel Siem also threw his club into the water on the same hole, but his action did not receive the same blanket coverage from the media. I understand that the scuba diver was not summoned to search for Siem’s club! The previous week, during the final round (played on Monday) of the Honda Classic at PGA National, Florida, Ian Poulter caused some raised eyebrows when he meticulously removed pine needles from the area that he had selected to drop his ball in. He was taking relief under penalty of one stroke from the water hazard on the par-5, 14th hole. Poulter was right to carefully remove the pine needles one by one, because if he had swept them away with his hand or club he would probably have also moved loose soil, which would have incurred a penalty of two strokes, as loose soil is not a loose impediment, except when it is on the putting green. Of course, players should ensure that they do not spend too long in clearing the area in which they are permitted to drop a ball, as they could then incur a penalty for undue delay (Rule 6-7), though unfortunately this does not happen very often, either on tour, or in most amateur competitions. It seems that the close attention that Poulter took in clearing his drop area did not help, as he then hit his ball off a palm tree back into the water, eventually finishing the hole by making a good putt for a triple bogey. Click here to check out my range of eDocuments that will assist you to obtain a better understanding of the Rules of Golf. Did Ernie Els Ground His Club in a Hazard?